AN enormous turnout of locals paid their respects to our fallen with a special Centenary Dawn Service at Stiggants Reserve in Warrandyte this morning after the march. The scene couldn’t have been more Warrandytian – more than a thousand residents lined Yarra St for the early morning march before walking to Stiggants Reserve for a moving service. A mild, calm morning set the scene and towering gum trees on the banks of the Yarra provided a backdrop with branches clearly the best seats in the house for the vocal resident kookaburras and other birdlife. 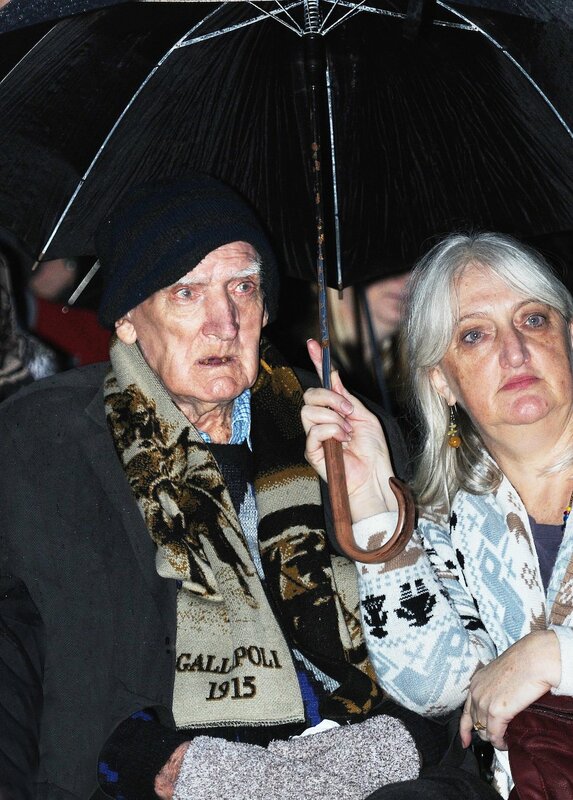 From babies, children and pets to families, our senior citizens, dignitaries and particularly our 93-year-old last surviving digger, Ben Jones (pictured with his daughter Helen), the atmosphere was emotion-charged and everyone united as one to pay their respects. To commemorate the 100th anniversary, the special service by the RSL Warrandyte Sub-Branch was headed up by immediate past president Henk Van Der Helm and included a Catafalque Party, bagpipers, singing by the Bellbird Singers, and a rousing rendition of Eric Bogle’s The Band Played Walzting Matilda by Barry Carrozi. That was followed by a touching poem and prayer, the wreath laying ceremony, The Ode by Robin Batty, Lament, a heart-warming Last Post and minute’s silence as rain started to fall and the sun started to rise. After the service, hundreds converged on the RSL Clubrooms for a Gunfire Breakfast hosted by the Lions Club.